Almost at the start of Advent, and here's a little gift for you crafty folk out there, my first ever tutorial (sound the horns!) This little chap can be made as a Christmas gnome or Santa, or indeed in any colour for other times of the year. He can made in a variety of sizes (although the tiny ones are a bit fiddly, but hey, I know some of you thrive on the fiddly stuff. If you wish you can give him a little pocket, front or back, to hold little surprises or notes of love..
Now then..onto the tutorial...sorry, some of these pictures a bit dark, but most of this was done after night had drawn in...and I hope I can explain OK, any questions, leave me a comment. 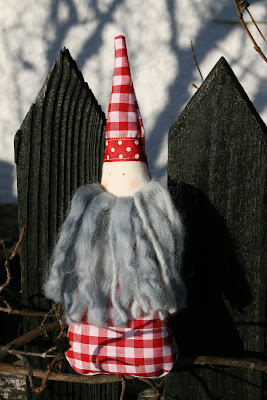 You will need: oddments of fabric - you can use up scraps and make the body, hat and back in different colours for a patchwork effect, linen or calico for the face, ribbon or ricrac trim (optional), wool or roving for the beard (I used some leftovers of Rowan's Biggy Print), stuffing, fine tipped permanant black pen, blusher and cotton bud (optional), small soft hairbrush, plus sewing kit. 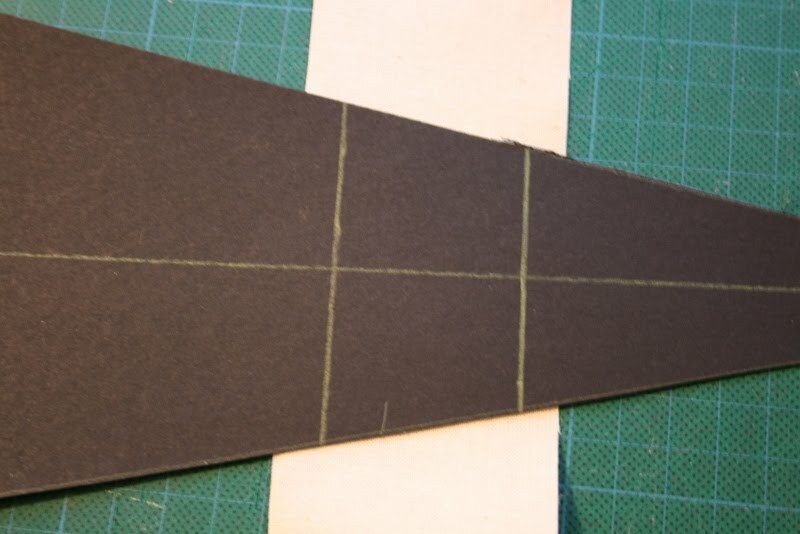 First print out a pattern..Sorry, I'm not terribly teccie, so this is not a pdf or anything, but right click on it, then 'View Image' and you should be able to print it off and make it the size you wish. My pattern just over 11 inches high. In this tutorial, my pattern is black - it's on card to make it a bit more durable and I just draw around it. Cut a strip of fabric for the face, allowing a quarter inch either side for the seam allowance - you can see I'm eyeballing the size I need... then cut fabric pieces for the front hat and front body, again allowing an extra quarter inch on one side. Then sew these three pieces together like so..does it make sense now? Press the seams open. If you want to add a strip of ribbon to the hat, now is a good time to do so. Pin, then sew it in place. 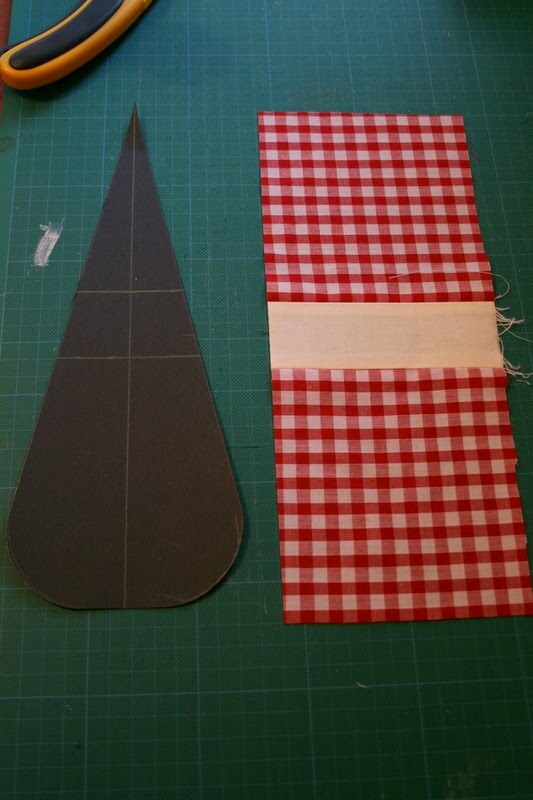 Now place the pattern on top, pin it on and cut it out. So far, so good? Now for the beard. 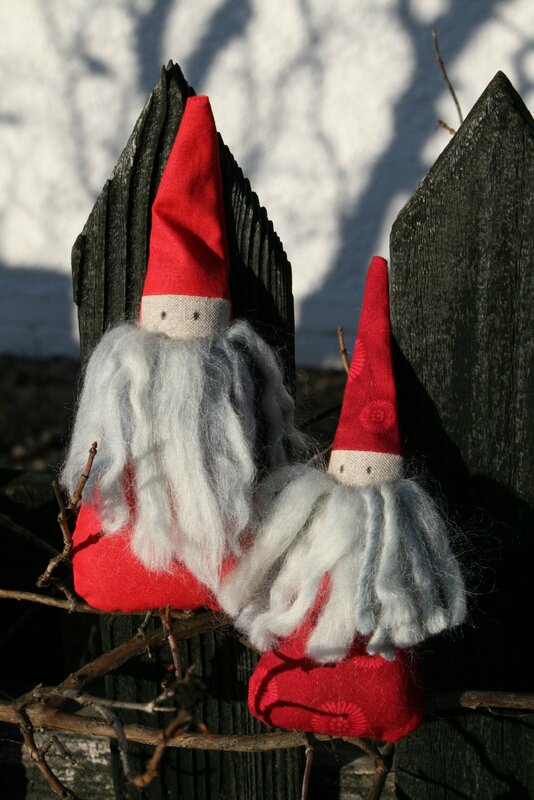 I used a lovely chunky wool which I cut into pieces, the length of the gnome. 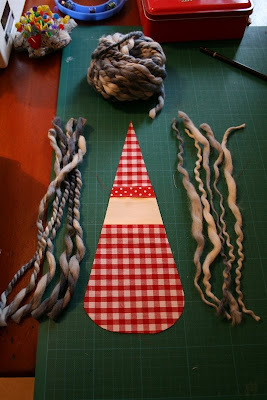 I then unravelled the wool strands, discarding any that were not the right colour. I ended up with about 10 lovely crinkly lengths. I think wool roving would be good for this too. The next bit is a tad tricky, but you'll get there. 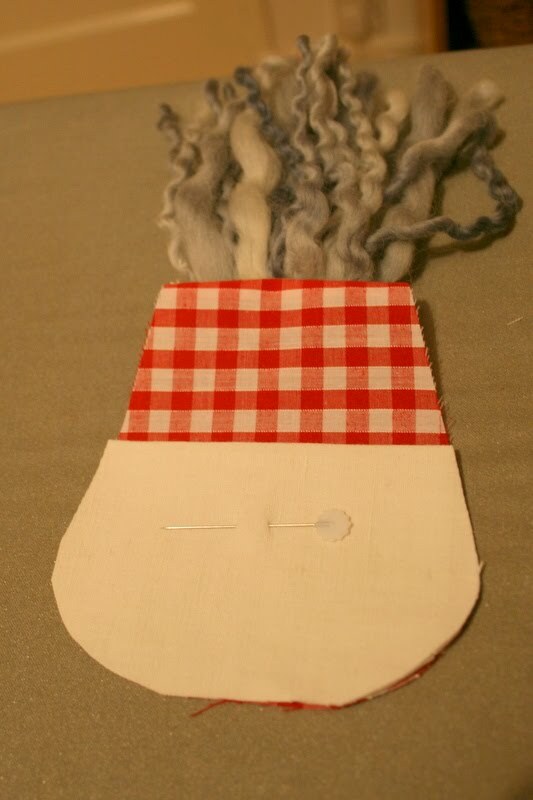 You need to sew the beard on following the line on the pattern (basically a gentle U shape from halfway up the side of the face). 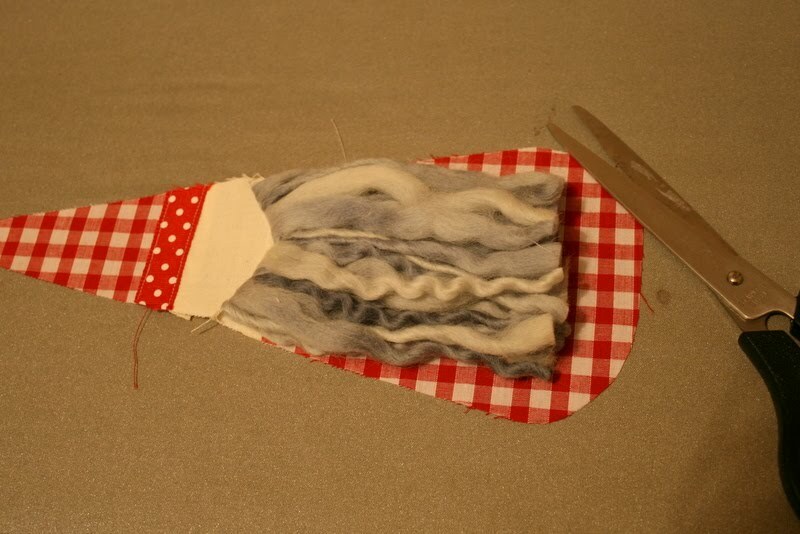 Hold the wool flat to sew it on evenly - you can always sew on an extra strand if you have any big gaps. 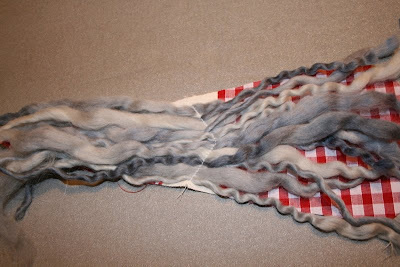 Make sure you don't sew the wool right up to the edge of the fabric. This is how it looks when it is done. 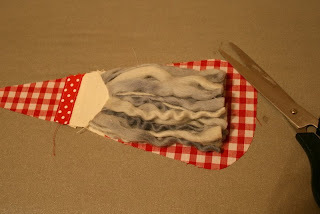 Then you fold the beard over, ironing it a little if need be. Give the beard a little trim. 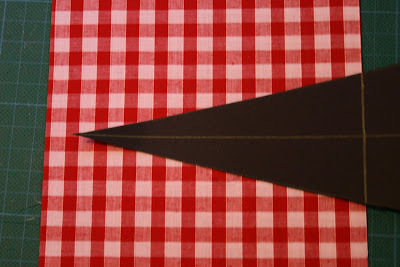 If you want to add a little pocket, you can do this now. 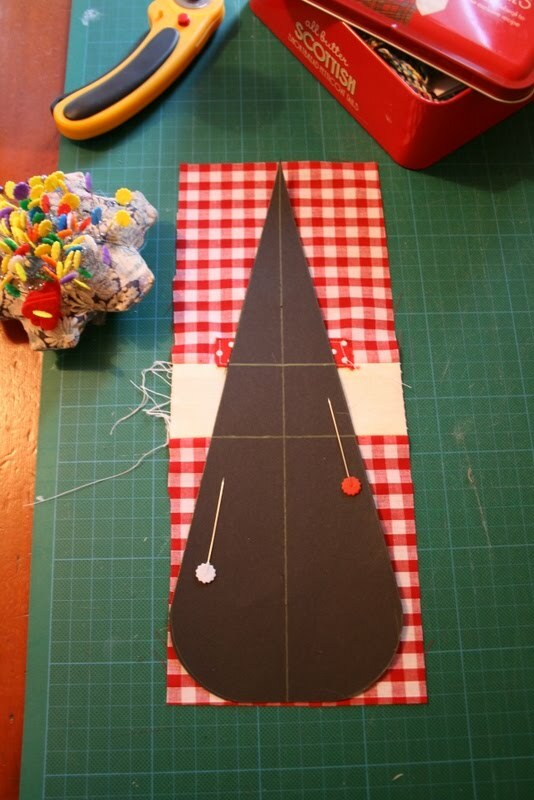 Take a piece of fabric as wide as your gnome and as high as the body and press it in half. I used some old white linen. 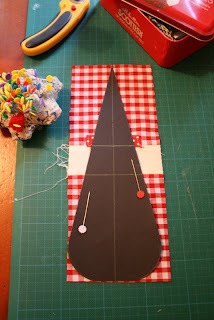 Pin it to the front of you gnome, fold towards the top, trim the fabric to the shape of the gnome like so.. Sorry, this is an awful picture! 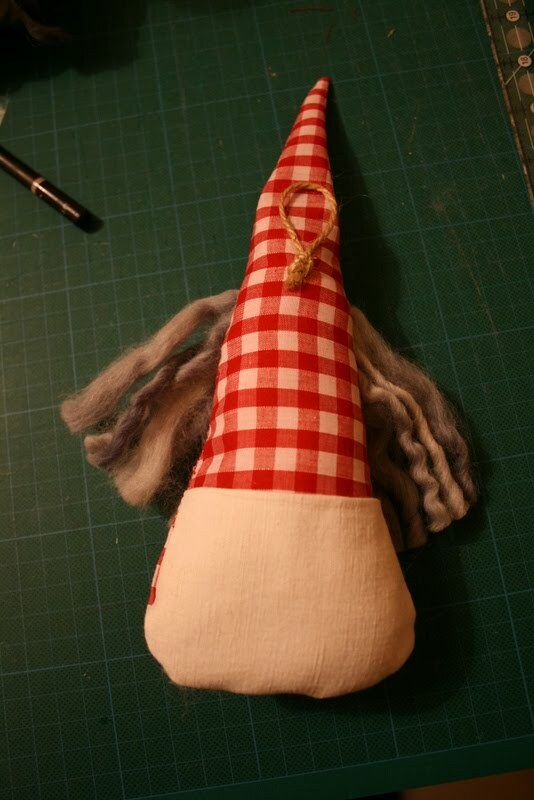 Then, sew around the gnome following the seam allowance on the pattern. 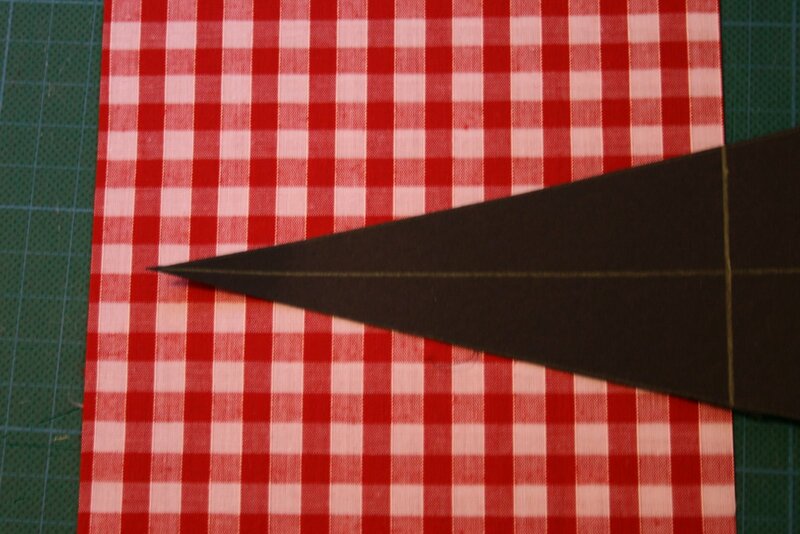 The allowance tapers towards the tip of the hat so it is not too bulky. Leave a gap for stuffing. 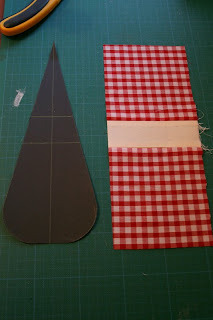 Trim away extra fabric at the point of the hat, and cut the back to match the front. Then turn the gnome right side out - a blunt knitting needle is helpful for getting the point of the hat, but poke gently or you will be making lots of cross noises if you get a hole in that hat! Stuff lightly - I stuff the face and body, but not the hat. 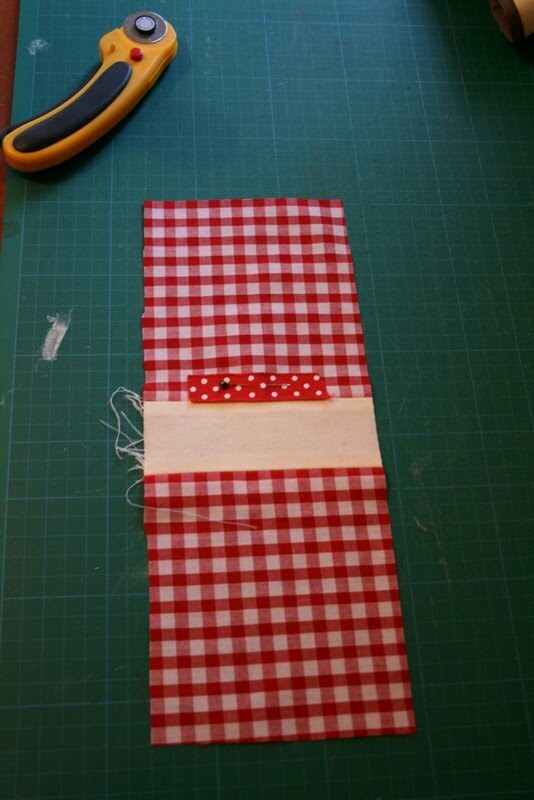 Then sew up the gap. 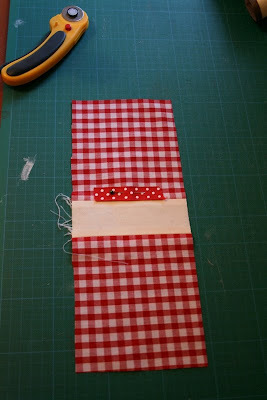 If you wish you can sew a little hanger on the back at this stage. 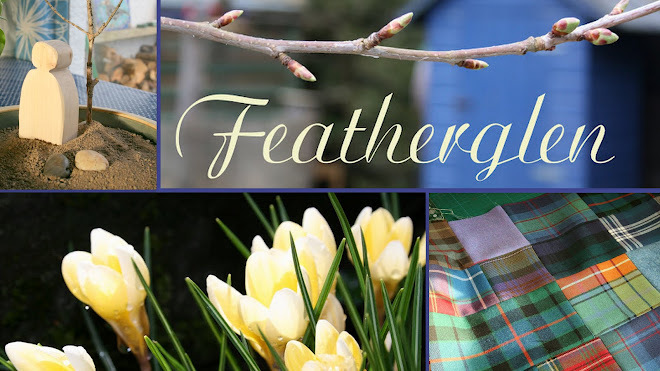 I use a 5" length of twine, folded and knotted together and stitched firmly in place. Nearly done! Give the beard a gentle brushing to fluff it up, then trim to desired length. Mark two small eyes with the black marker, then apply a bit of blusher with a cotton bud. 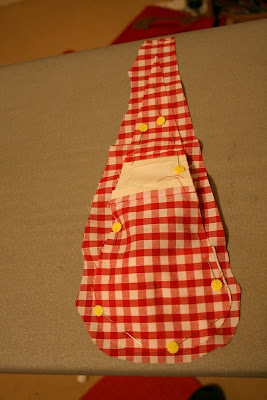 The pocket can be turned to the front or back. Fill with some token of love. Phew! Here endeth the most monster posting ever. 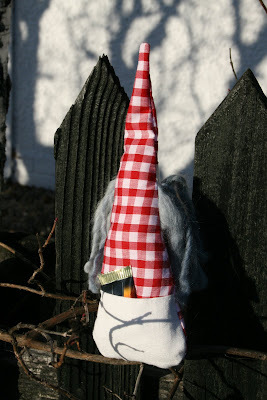 Please do let me know if you make a gnome and send me a link to your picture of it, I'd love to see what you make too! Thank you for sharing. I just may try this guy! One year, I made felted Santas -- and lots of them. They were taking over the house. So this could bring variety to my life!